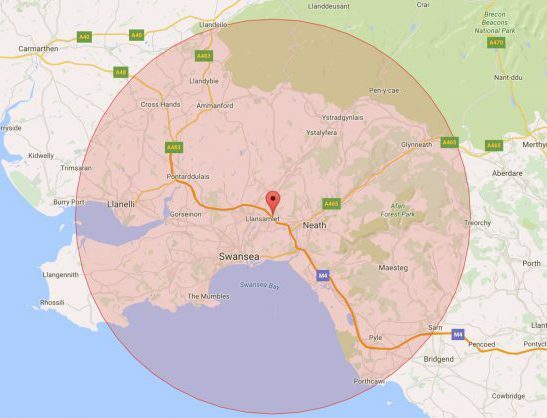 We roughly cover a radius of 15.5 miles (25 km) from our base in Birchgrove. JPC have loyal customers from as far as: Glynneath, Abercraf, Ystradgynlais, Brynamman, Ammanford, Crosshands, Llannelli, Mumbles, Killay, Sketty, Uplands, Neath, Port Talbot, Pyle, Porthcawl and everywhere in between! JPC also serve customers in Rhossili and Port Eynon which are just outside the area and are charged a nominal extra fee for mileage. Please don’t hesitate to tell your friends and family in these areas about us!